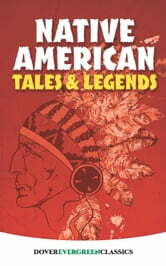 This exciting collection contains more than thirty richly imaginative stories from a variety of Native American sources — Cherokee to Zuñi, Pawnee to Midu — covering a broad spectrum of subjects, as well as tales of little people, giants, and monsters, and of magic, enchantment, sorcery, and the spirit world. Readers will find stories telling how the earth, people, and bison were created and how fire was discovered, while others introduce the hero Glooscap and the Maiden of the Yellow Rocks. Still other traditional tales tell of the troubles Rabbit's boastfulness got him into, and about the clever ways Little Blue Fox managed to escape from Coyote. Among the stories in this collection are "The White Stone Canoe" (Chippewa), "Raven Pretends to Build a Canoe" (Tsimshian), "The Theft from the Sun" (Blackfoot), "The Loon's Necklace" (Iroquois), "The Rabbit Goes Duck Hunting" (Cherokee), "The Coyote" (Pueblo), and "The Origin of the Buffalo and of Corn" (Cheyenne). Young people will delight in these tales, as will any reader interested in Native American stories or folklore in general.